The tires are a material that is present in our daily life and it would be unthinkable that the current society could live without them; from a bicycle in Africa to a passenger truck in London they use tires. Every year for more than fifty years, millions of tires are discarded in the world. The oceans have been and are the world’s largest tire dump. Normally, we think if we do not see it; then, there is no problem or it is not happening. Hundreds of meters under the sea where no one sees them the bottom of the sea is made of rubber; the rubber begins to disintegrate little by little every day, polluting marine animals, plants and as a consequence humans. However, landfills in the oceans are not the only ones. Tires have crossed borders and there are thousands of miles in the world dedicated to tire dumps; there are landfills on every continent waiting for someone to solve the problem that has become unsustainable. It is not a problem that is out of our reality, it is not a problem of other countries. 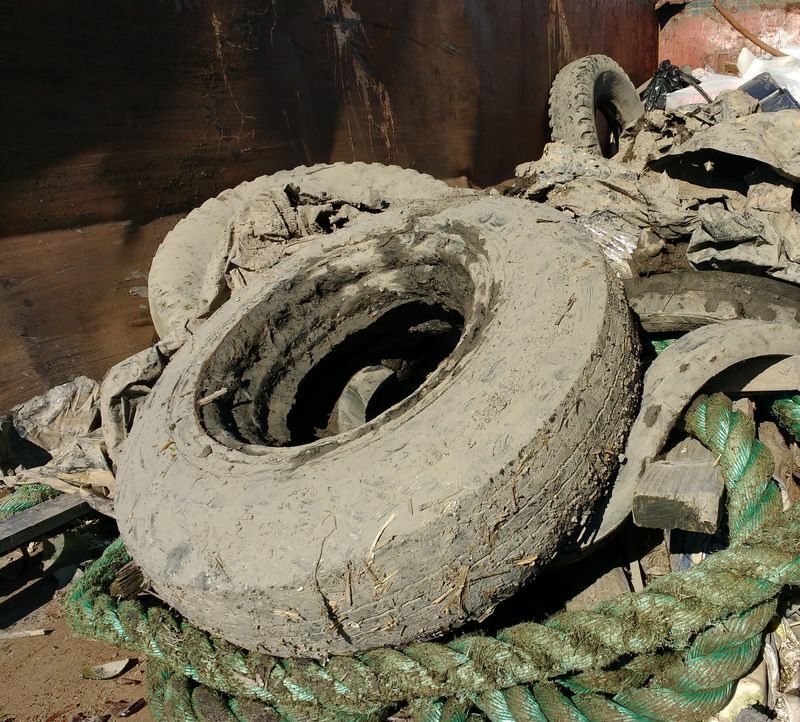 Unfortunately in the United States there are tires that are thrown illegally and they are in the streets; however every day begins to grow the awareness of taking the tires that we no longer use to some landfill that does the work of a scrap tires disposal. There are several methods for successful scrap tires disposal. The first is the thermolysis this is when the tires are subjected to very high temperatures without oxygen. When the temperature rises and there is no oxygen, the chemical bonds that make up the tire can be destroyed and as a result hydrocarbons are obtained. This process is used by the cement industry because with this process they can obtain metals, solid and gaseous hydrocarbons and they can also be reused for tire production. Pyrolysis is the chemical decomposition caused by high temperatures and the absence of oxygen but the advantage is that they do not produce toxins to the environment. The rubber degrades and emits a gas that is used for the production of diesel, steel, among others. Incineration is another type for scrap tires disposal; in this one is carried out combustion in furnaces until the rim turns to ashes (this one if it has oxygen). The heat generated in this process can be used as energy because the rim has high heat properties, so when it burns an outdoor landfill is so dangerous; because in a matter of seconds hundreds of tires start to burn propagating the fire and emitting toxic gases such as release of gases like carbon monoxide, oxides of nitrogen, oxides of zinc, oxides of lead, among other residues soluble in water that would easily affect humans. Furnace incineration is capable of producing more energy than coal or other natural fuels and is therefore used by various industries such as derived fuels, saving costs and increasing energy. Another way to perform scrap tires disposal is by cryogenic crushing. This type of crushing is not very common for that reason is not very profitable nor highly recommended because there is low quality and difficulty separating all the materials of the tire. The mechanical crushing is the scrap tires disposal that we made in Globarket; this process is mechanical. We do not use chemical agents or heat. Our process consists of grinding the tires. The size will depend on the next use that you want to give the recycled tire; usually the larger pieces are for material infill and aggreggate material. On the other hand, rubber mulch and buffings are smaller in size and used for lanscaping; finally crumb rubber and granulate are the smallest and are used for the elaboration of playgrounds, speed bumps or highways. After grinding the tires, the metals can be separated with magnets to leave only the rubber. Currently, rubber is used as a derived fuel to create energy in many industries, including electric. The rubber will begin to have greater value (more cost) at the moment where the population knows all the applications that the recycled tires may have. Every day there are more products that we can realize and also more and more people are concerned about the environment. Some of these applications are as fuel, rubberized asphalt, carpets, shoe soles, acoustic insulation, waterproofing, athletic tracks, sports fields such as football and soccer; for building materials, tiles, to fill up land in civil engineering or in retaining walls. It’s time to avoid having the tires forgotten in thousands of landfills in the world, take advantage of the recycling plants and the thousands of uses that we can use (and those that are yet to discover! ), Creating a culture of recycling and prevent our world is overflow with tires in the next few years. Finally, we invite you to consume products made of rubber like those produced by Globarket; browse our website and know our diverse products that have applications for hundreds of industries; our recycled tires are of excellent quality. Together we will achieve positive transformations in society, there are many applications to use scrap tires and the benefits for our world are gigantic because we are working together in decrease pollution and tires dumps around the world. If you have any questions about our products or the uses you can give to recycled tires please contact us.